Each person and each organization has a distinct blend of skills, experiences, and values. Understand these elements and how to leverage them and you have the key to effective team building. Skillblenders’ workshops, consulting, and coaching are some of the most efficient, effective ways for organizational teams to enrich understanding of their unique blend. Bringing together everyone’s unique behaviors and preferences to form a cohesive, productive team takes work, but the payoff can be huge – for individuals, the team, and the organization. This approach is a developmental commitment that can help transform the group into a cohesive, performing team. The Five Behaviors of a Cohesive Team™ is a unique learning experience that helps people discover what it takes to become a truly cohesive and productive team. The program materials include flexible facilitation with two options: the One-Day Facilitation Program or Three-Day Facilitation Program. A comprehensive, highly personalized, and accessible 37-page illustrated report that helps each person on the team, and the team as a whole, understand how they scored on the assessment and how to interpret their individual and team results. The profile includes an introduction, a section devoted to each of the five behaviors, a summary of the team’s strengths and challenges, tips, and suggestions, and a roadmap to help teams create an action plan based on their results. A 20-question Team Survey that explores this team’s current perceptions of where they are in Lencioni’s 5 elements. A Team Culture section that allows team members to provide feedback on how to improve performance on this team. The information in the DiSC feedback is personalized to the individual. The Team Survey and Team Culture data are aggregated anonymously to facilitate further discussion. To enable better relationships between team members, The Five Behaviors Comparison report is available and to determine progress, a Five Behaviors Powered by Everything DiSC Progress Report is available. Contact us for more information. 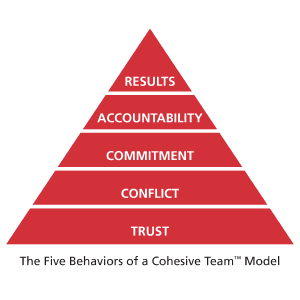 Check out the Assessments page for a video from Patrick Lencioni, a leader at the Five Behaviors of a Cohesive Team™. See the Five Behaviors™ website for additional information.